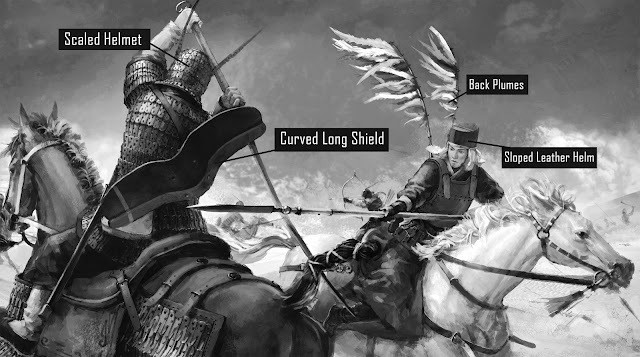 Art from Tiger Knight, Empire War. 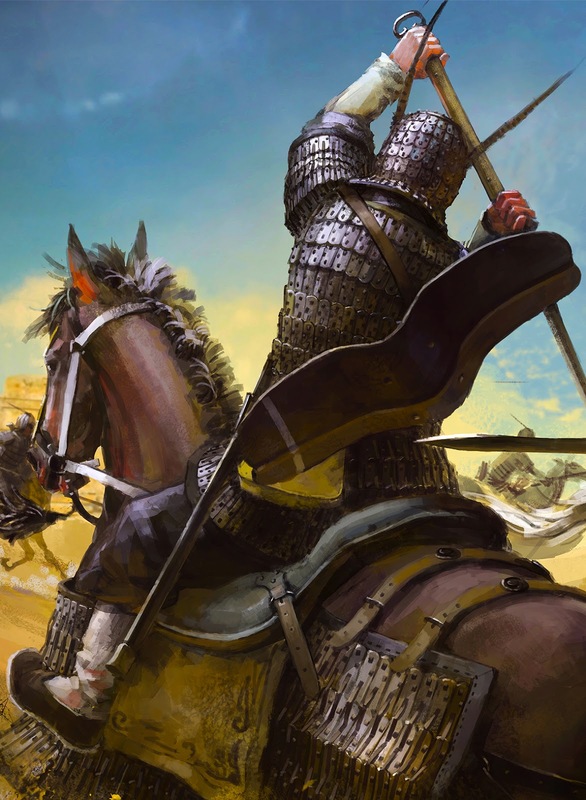 Light Han dynasty cavalry man wearing a prominent 负 Beiyu, or "Back Feathers" engaging a fully armored Han dynasty cataphract encased in lamellar armor. A number of Han dynasty warrior figurines unearthed from at Yangjiawan in the northern suburbs of Xianyang City, Shaanxi Province depicted Han cavalrymen wearing a very distinctive 负羽 Beiyu, or "Back Feathers" on their backs. 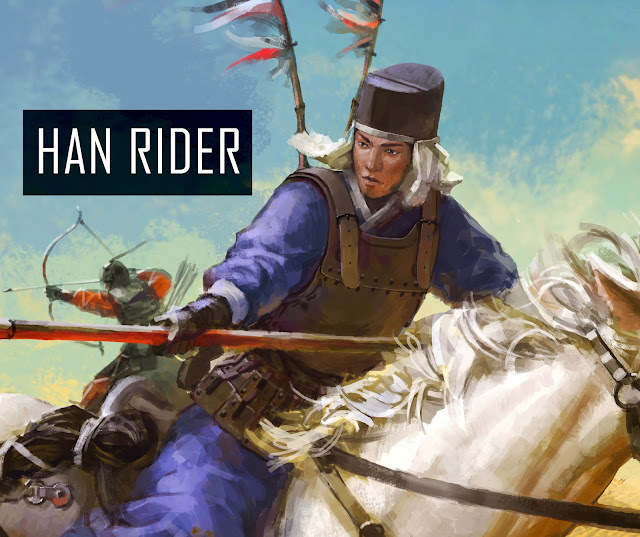 It should be noted that this is not what most of the Han cavalry looked like, however there were enough of horsemen figurines with feather banners on their backs found (see below) that their presence did generate an academic debate among historians in regards to the function of these back banners. 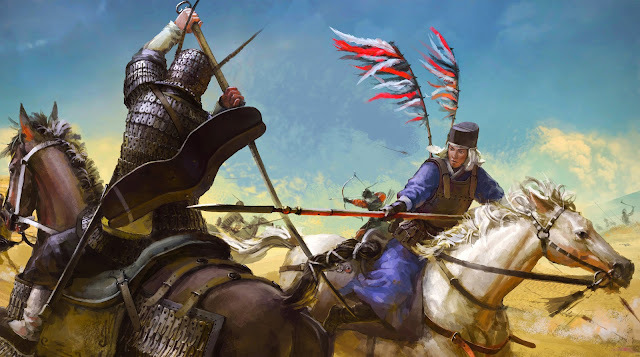 It is apparent enough that these men were a marvelous sight to behold, bearing a strange resemblance to the winged hussars of the Polish- Lithuanian Commonwealth. 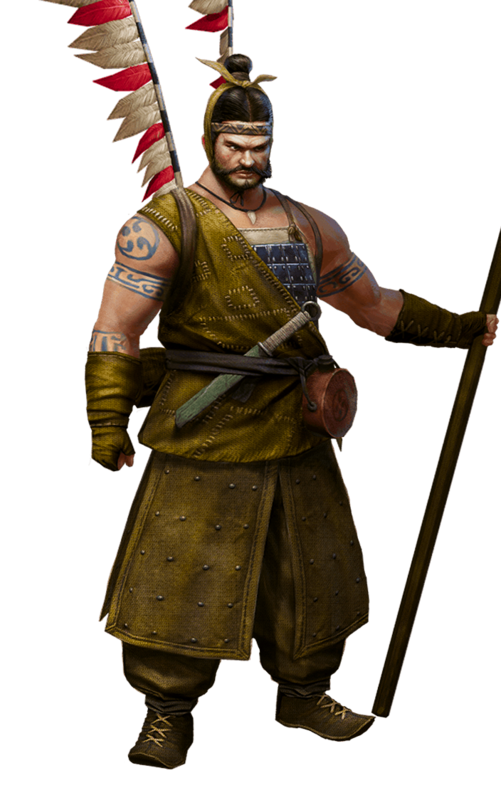 They would have been fielded by the Han around 1st Century BC and the wars of the Three Kingdoms period. Personal markers: In order for a massive army like that of the Han to function properly in the field, a strict chain of command was established. Elaborate banners and insignia were used to distinguish the many units on the field. Aside from war flags and heraldry that marked whole cohorts, the soldiers were also color-coded with different colored clothing so as to be easily distinguished by commanders. Beyond those, there were even more elaborate visual signifies to mark the soldiers. 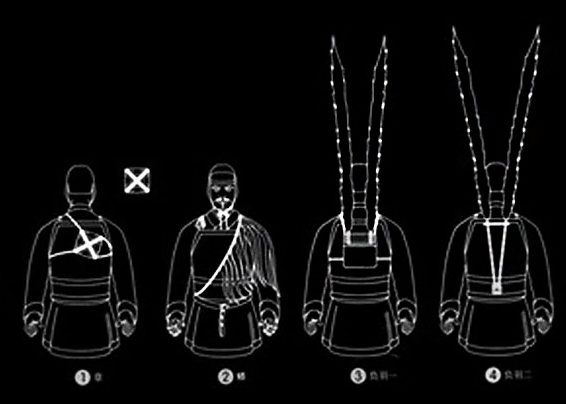 Of those (above), soldiers frequently wore the 章 Zhang, or "Badge" that was strapped to their backs which functioned similar to a modern ID badges, and bears the soldier's name, unit, and the name of family members. If the soldier is killed, he can be identified accordingly from the badge, so that he can record and send it to his hometown. This kind of badges can be seen on the Han terracotta warriors and cavalry of Yangjiawan. The second 幡 Fan, which merely meant a draping flag (think long frontally draped prayer flags) these were mainly seen draped over the shoulders among some of the Yangjiawan Terracotta Warriors like a row of long flowing tail-feathers of fowls. However, it is not know what their uses were. Some scholars believe that it either marked a commander or that it marked a messenger. Lastly, we have the 负羽 Beiyu, or "Back Feathers," these were quite tall and some are half a man's height compared to the figurines. Such prominent markers would doubtless mark the rider on the field. Originally the archaeologists and the historians identified those as crossbow quiver boxes but upon closer scrutiny they discovered that the boxes were designed to have other functions. 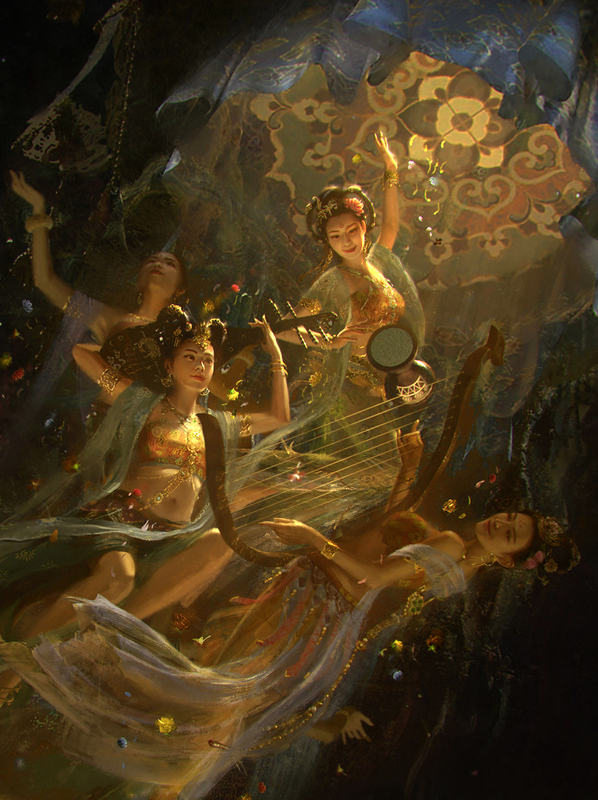 This is supported by contemporary sources during the Three Kingdoms period. 韦昭 Wei Zhao (204–273). the scholar and historian of the kingdom of Easter Wu recorded in his Annotations to Guoyu (国语注)- "Annotations to the Discourses of the States," quoting records that dated back to the times contemporary to Confucius that the tradition of having some sort of feathers on the back of soldiers that dated as far back as the days of the eastern Zhou period, as early as the Spring and Autumn period. Saying that “羽，鸟羽，系于背。" ~"feathers, from birds and fowls were strapped on the back (of soldiers)." 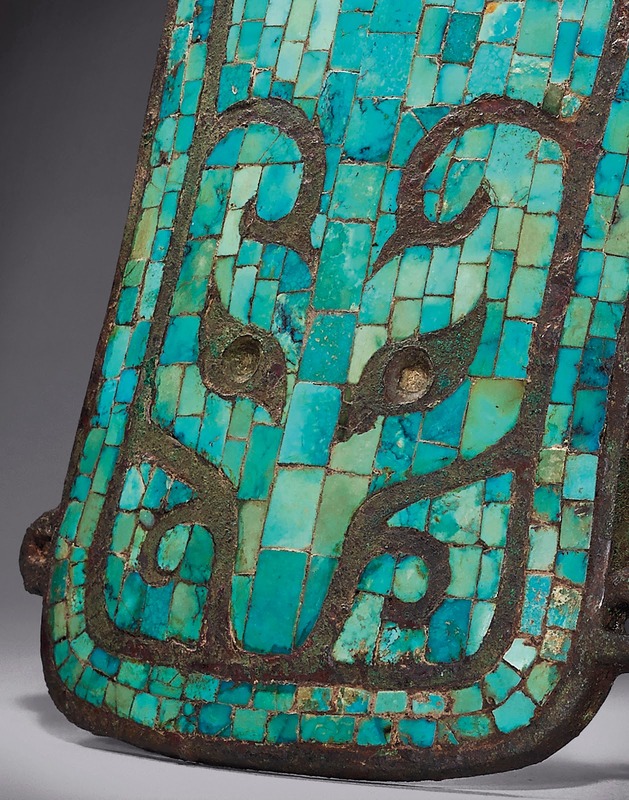 Bronze gongs and vessels from those period also depicted warriors wearing back mounted insignia. In the Confucian Xun Kuang's 荀況(314 – c. 217 BC) massive compendium~ Xunzi 荀子, saying that during his days, "the army of the left bore a rolled up banner, its foot soldiers bore 卷羽 rolled up feathers. The army of the right bore a white banner, and its foot soldiers bore 白羽 white feathers. 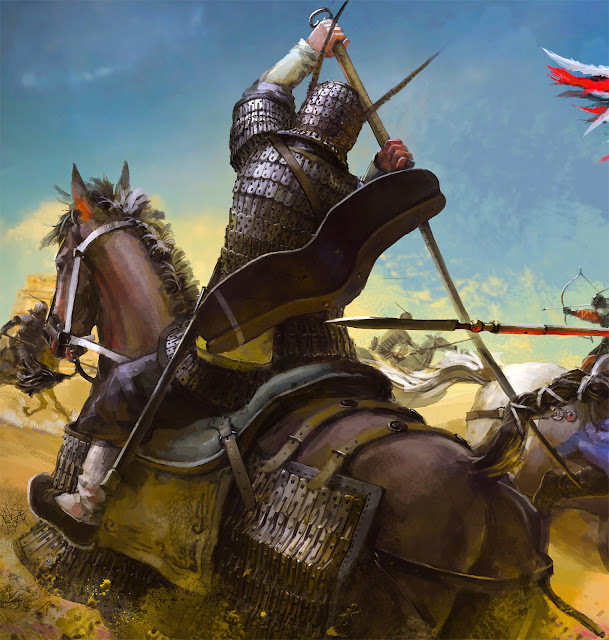 Finally, the army of the center bore a yellow banner, its foot soldiers bore黄羽 yellow feathers. Naturally during the course of centuries, the stylings and the color schemes of the insignia changed, however it still remains that soldiers in different divisions bore different colors of feathers for easy identification and coordination. In terms of utility, historians are still unsure of who the intended wearers of those banners were. Some historians have argued that these were worn by commanders or especially chosen warriors. 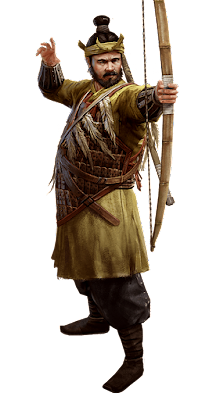 But others challenges this notion as it marks the wearing for enemy archers. 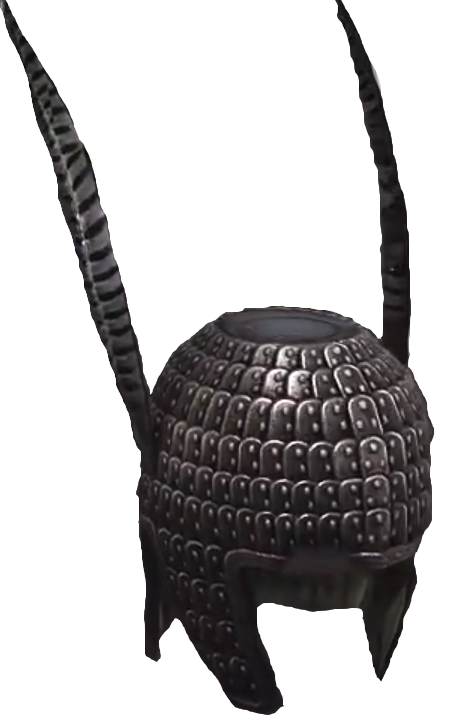 It is possible that these were used by the messengers. 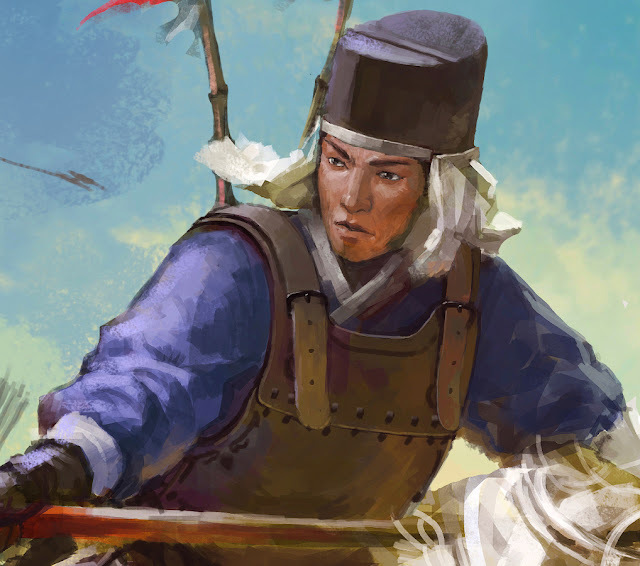 In detail: Scale helmet with jutting pheasant feathers. 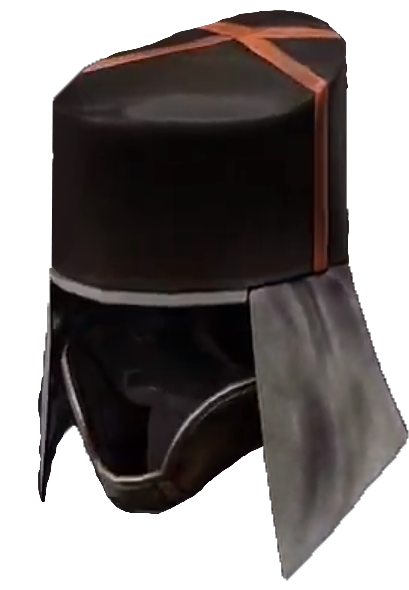 Light cavalryman's sloped leather helmet. 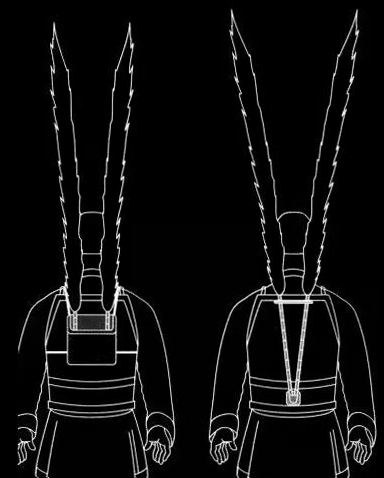 Heavy Han dynasty cavalryman encased in lamellar armor with a curved long shield strapped on his back. 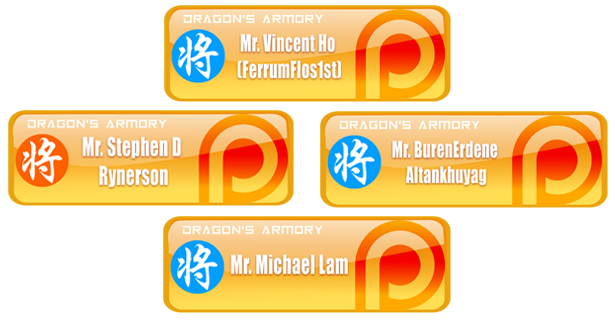 Thank you to my Patrons who has contributed $10 and above: You made this happen! Interesting. He looks like the feathered Polish cavalry that saved the day at the Siege of Vienna. 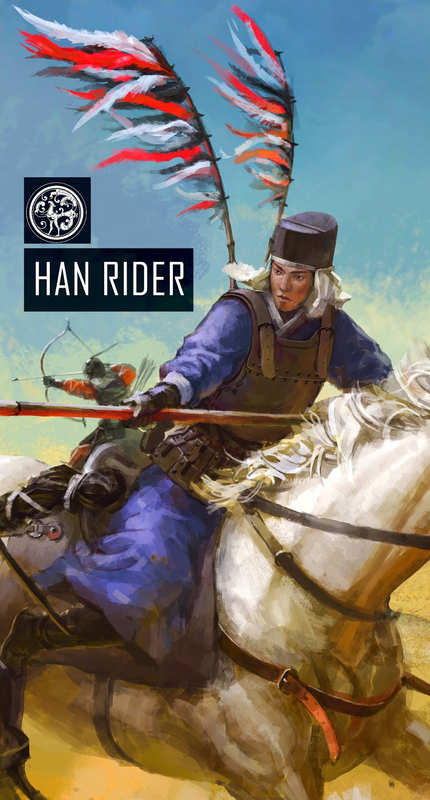 Totally, I was extremely skeptical when I first saw a lot of Han cavalry depicted like this in several games and entertainment mediums, but then I dug deeper and found out the origins of these units. Many historians still don't know the role that they played, but they sure look striking. 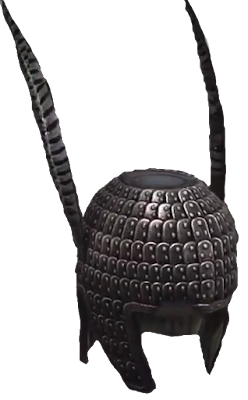 Some internet commentators have suggested that these back feathers belonged on the back of the elite 羽林军 Yulin Guards, or the "Forest Feather Guards" they were one of the elite guard units of the Han dynasty. However these are only suggestions at best since there is no official documents that associates these figurines to the Yulin Guards.